In Arlington, 535 households face eviction each year, largely due to the high cost of rent. With Amazon’s announcement to locate a headquarters at National Landing comes the opportunity to redouble efforts to support affordable housing in Arlington. In December 2017, the Arlington County Board approved Phase 1 of a proposal for a Housing Conservation District (HCD) that will provide protections and incentives to preserve or replace affordable apartments in market rate affordable buildings. Phase 2 of the plan, which includes developing a set of incentives to help property owners renovate or redevelop their properties in exchange for affordability protections, will be developed throughout 2018. The Housing Leaders Group of Greater Washington released A Guidebook for Increasing Housing Affordability. 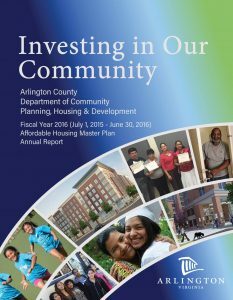 This catalog covers a variety of affordable housing tools used locally in Arlington and examples of tools used in other counties. Although AHS focuses on local and regional housing issues, we always stay plugged into the latest national research on housing challenges and affordability to inform our work. Check out these recently released resources that provide evidence for the continued need for addressing housing affordability in Arlington and all our communities. AHS has a tradition of asking candidates running for the Arlington County Board to answer a set of questions related to affordable housing. This year, four candidates are running for the Democratic nomination. 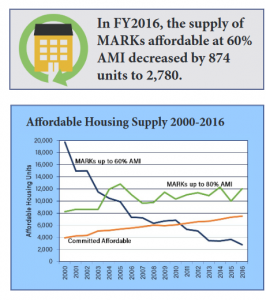 Market Rate Affordable Housing (MARKs) are an important part of the affordable housing stock in Arlington that serves low- to moderate-income households. MARKs are units that are affordable to moderate or low-income families due to amenities, condition, age, and/or location of the units. The rents are not regulated by any agency allowing for diversity of incomes in buildings or neighborhoods. This chart, taken from the county's first annual report on the Affordable Housing Master Plan shows how drastically we are losing MARKs (blue line). Read how the County did in its first year implementing the Affordable Housing Master Plan (AHMP), including a look forward at multi-year projects. See the County's Annual Report page for context and information on past goals and targets.